While it has the appearance of a legend, modern Zionism founder Theodor Herzl himself recorded the fact that he planted a cypress tree on his visit to Motza, located outside Jerusalem. Reprinted with permission from The Jewish Holidays: A Journey Through History (Jason Aronson). Most everyone knows that the holiday of Tu Bishvat is associated with the planting of trees in Israel. Throughout the centuries, trees have been planted in Israel on Tu Bishvat as a celebration of the special qualities of the land, as well as its connection to the Jewish people. Prior to the scorching of the land by Roman legions following the Judean revolts over 1,800 years ago, Israel was adorned with lush forests and bountiful produce. In the latter half of the 19th century, when the Ottoman Turks ruled the land, the first waves of Zionist immigrants began to arrive. Their objective was to develop the land and restore it to its former splendor. When Tu Bishvat arrived, they would gather together and mark the day with tree-planting ceremonies. Soon, clusters of young saplings were transformed into forests. Each forest that was planted brought the dream of a Jewish state a little closer — a dream that seemed distant while the land was under the harsh rule of the anti-Zionist Turks. Just as every forest was precious, so too was each tree. The story of one particular tree symbolized the plight of Zionism in its earliest days and proved that adversity might be an obstacle but not a deterrence. No impediments would prevent the development of the land of Israel. While visiting Israel in 1898, Theodor Herzl sought an audience with German Kaiser Wilhelm II, who was also in the Holy Land. After visiting the coastal settlements of Mikve Yisrael and Rishon LeTzion, Herzl traveled toward Jerusalem. As he passed through the Judean hills, he noticed its splendor as well as its barrenness due to neglect over the centuries. However, he noticed an island of green amidst the desolation. It was a small Jewish settlement, the only one in the area. The settlement, named Motza, possessed a population of 200 people and was located several miles west of Jerusalem. Its abundance of olive, date, and apricot trees, along with clusters of grapevines, gave it its fertile appearance. Herzl and his entourage proceeded toward the village, where he was warmly received. As he rested in the shade, he gazed upon the land of Judea. The sun began to set and a variety of lights of brilliant colors reflected upon its hills. Captivated by the sight, he told members of his entourage that he wished to plant a tree at that location. Herzl ascended the hill and planted a young cypress tree. The tree grew rapidly. Six years later, it stood tall and statuesque signifying to the settlers the Jewish people’s return to Zion. Seven years later, on the 20th day of the Hebrew month of Tammuz, 1904, Herzl died at age 44. The stunned members of the Yishuv (Jewish community in pre-state Israel) mourned his death and continued to commemorate their leader in the years to come. On the day of his yahrzeit (the anniversary of his death), Zionist youth continued to ascend that hill and plant trees around Herzl’s. When World War I broke out several years later, the British and the Turks were locked in a bitter struggle over control of the Holy Land. As the tide of battle was turning in favor of the British, the Turks, suffering a wave of defeats, vented out their anger upon the Zionists. Many Zionists were imprisoned or exiled; others had their wealth and businesses confiscated. Despite the hardships, the settlers continued to develop the land. When the 20th of Tammuz arrived in 1917, Zionist youth, in accordance with the annual custom, once again returned to Herzl’s tree, but they found that it had not survived. The Turks had hewn it down. Scattered around the remains of the tree, the young Zionists found cones from the cypress tree, which they placed in their pockets. They returned to Jerusalem under cover that night to avoid the watchful eyes of the Turks. Those cones, which contained numerous seeds, were carefully guarded. In 1917, the Turks were defeated and forced out of the land. The 400-year rule of the Turks was over. Those who collected and guarded the seeds proceeded to plant them throughout the land. Soon, from Herzl’s destroyed tree, many young trees sprung forth across the land of Israel — from the Galilee to the Judean hills. The settlement of Motza was likewise cut down. 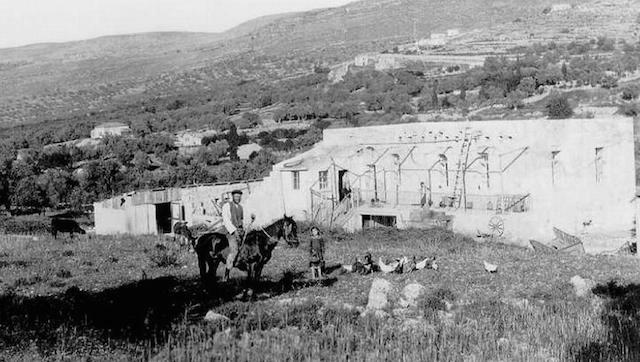 A wave of Arab riots against the Jews erupted throughout the Holy Land in 1929, and Motza suffered at the hands of Arabs from neighboring villages. The beleaguered settlement was soon abandoned. However, four years later, a new settlement, Moshav Motza Ilith (Upper Motza) was established near that location, situated slightly higher on the same hill. In clear view of the Moshav rested the remains of Herzl’s cypress tree. A tree was cut down, but its seeds remained in order to be planted in the future. On Tu Bishvat, a nation plants seeds to recover what was lost in the past. The Romans might have left the land bare, but there was always hope for its revival and the renewal of its legendary forestry. Every Tu Bishvat those seeds, which are remnants of the destruction of forests in the past, are planted to build future forests in the land of Israel.